Poppins Bag: this large zipper top bag is great for all of your magical stuff! There are two pockets on the outside and inside (to help keep you organized) and structural stays to keep it in shape. A large zipper keeps the bag closed. In this class you will learn how to: channel quilt using a quilting guide; sew in a zipper; make rounded, filled handles; and how to make a channel for the metal stays. This class will use fabric yardage and not 2 ½ inch strip sets or jelly rolls. 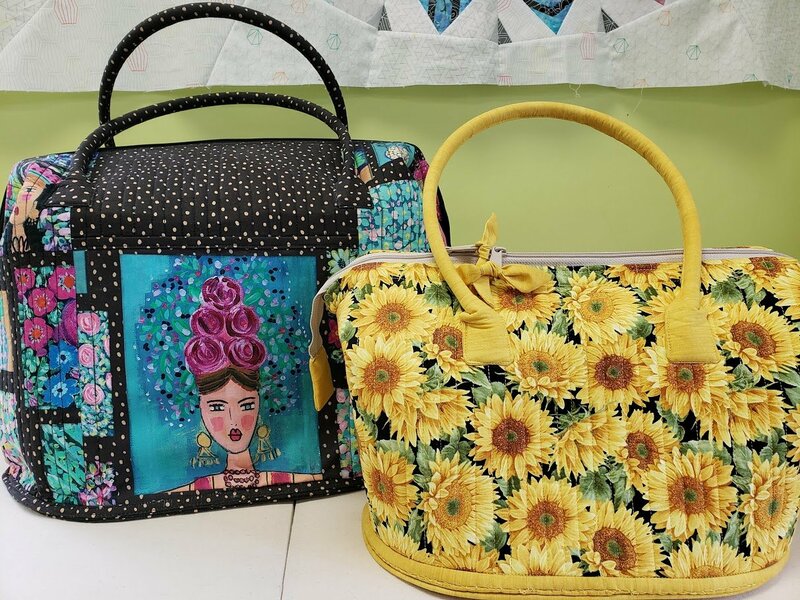 Mini Poppins Bag: you loved the Poppins Bag and now there are two new, smaller bags to sew. Inside the bag are 10 pockets to hold all types of essentials. The small bag makes a perfect purse or for those of you who like a larger purse, choose the large bag (it would also work as a class bag). Both bags have a zipper closure and optional stays. Requirements: Students must come to class with all fabrics and foam cut and labeled.